These skins are made using a durable vinyl material with high tech adhesive that leaves no residue. 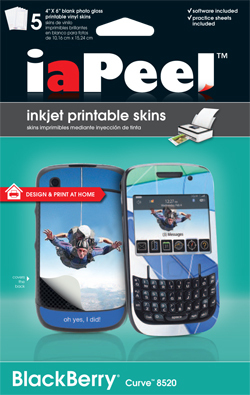 All you need is an inkjet printer to produce your own photo-quality skins. There's even a built-in alignment system... just pull up the tabs and your device fits right inside. No more worries about putting it on crooked. Express yourself by creating a customized skin with your favorite photos, artwork, team logo, or anything else you can think of. We make it easy. You make it cool.